Off-Road Support/TBT Racing Kawasaki privateer Jacob Argubright topped one of the largest fields in event history to run away with the GMV UTV Winter Nationals Parker 250, Presented by Polaris RZR, round one of Best in the Desert’s (BITD) American Off-road Racing Series, January 14-15. Completing all three laps of the 78-mile by himself in four hours, 13 minutes and 32 seconds, he defeated all multi-rider teams to start the season aboard his Golden Tyre/Maxima/Fly Racing-backed KX450. “I started on the first row—there were two of us [the other rider being eventual third-place Open Pro Wyatt Brittner] and I battled with him going into the sand wash around mile five and I got out front. Cooper’s squad included Kyle Tichenor, Troy Vanscourt and Justin Wallis, and they finished in 4:25:15 aboard their Cooper Motorsports 747/Monarch Honda/Fly Racing CRF450R. 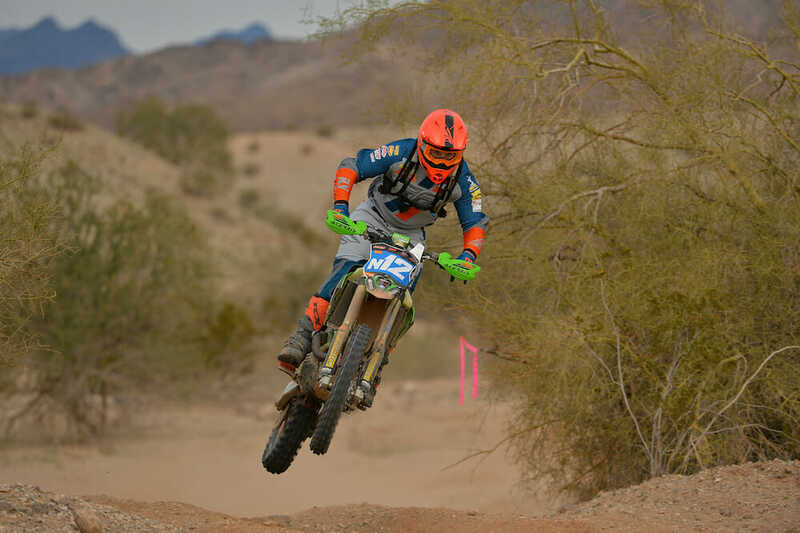 Over 30 Pro winners Reece Honea and Carl Maassberg completed the three laps in 4:30:19 for third overall on their speedy C&J Equipment/Reno Motorsports/Acerbis Husqvarna FE 501 despite a minor tire issue later. Defending series champ Brody Honea crashed hard on the first lap and went to the hospital for a severe arm laceration. That left partner Tuffy Pearson to finish the rest of the race on his own after quite a bit of down time (he had to go from the alternate pit at Midway where he’d been waiting back to the main pit), and they finished a lap down for eighth in class on their Chidester Transport Racing/JS Buchanan Trucking/Kenda YZ450FX. However, that was probably better than the Richard Gray/Brad Millikan/Deegan Newton/Jeremy Newton entry who unofficially ran second overall for much of the race until their Pride Communication/Lusk Plumbing YZ450F broke about 30 miles from the checkers for a disappointing DNF. Brittner and Jason Alosi took fourth overall in 4:34:34 on their Reno Motorsports/Nak Performance/Nitro Mousse-sponsored 450 XC-F with Taylor Stevens’ team fifth on their YZ450F. The winning Quad Pro team set the sixth-fastest time for the day; among two-wheeled entries, Open Expert winners Jaxon Bogh and Corbin Eatherton were next at the finish followed by 300cc Pro winner Dave Lahn. Fifth-place Open Pro Zachary Myers, runner-up Over 30 Pros Jesse Canepa/Danny Cooper/Kyle Tichenor and Over 40 Expert winners Paul Luce/Chad Thornton/Jason Trubey rounded out the top 10 overall motorcycle teams.